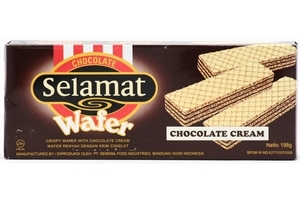 Selamat Crispy Chocolate Cream Flavor Filled Wafer in 7oz (200g) pack. Wafer Selamat, enak dan gurih. Product of Ceres Indonesia. Halal Certified حلال . sugar, wheat flour, vegetables fat, cocoa powder, milk powder, soya lecithin, salt, baking soda, vanillin. may contain traces of nut.